White-tailed deer are very adaptable creatures, equally at home in forests and fields as well as suburban neighborhoods. There are approximately 500 deer on Kiawah Island and they can be seen on all parts of the island, mainly during the hours between dusk and dawn. Kiawah Island’s white-tailed deer are the same species as deer in the Northeast and Midwest, although they are smaller in size. Their smaller size allows them to cope better with the warm climate of the Southeastern coast. During the summer, deer are slightly reddish in color; by mid-October they will have attained their winter coat, which is thicker, darker, and gray in color. One of their most distinguishable characteristics is the white underside of their tail. Deer raise their tails when they are alarmed as a warning to other nearby deer. You’ll be sure to notice it if you startle deer on your walks around the island. The rut, or breeding season, runs from September to January, though the majority of breeding takes place in October and November. During the rut, both bucks and does are very active and are often seen during daylight hours. The bucks you see during these months will have well-developed, hardened antlers. Bucks use their antlers to mark their territory by rubbing them against small trees and saplings; these signs are called rubs. Bucks will also occasionally fight during this time of year using their antlers as a weapon, but serious injuries during these fights are rare. In late winter each year, bucks will shed their antlers. Almost immediately they will begin growing a new set, typically larger and heavier than the previous years’. Antlers grow very quickly and are covered with a velvety, highly vascularized membrane. By August, that “velvet,” which supplies the necessary nourishment to the antlers, has dried and been rubbed off against trees and bushes. The antlers are now fully grown and hardened, ready for the breeding season. Fawns are born from April to July after a gestation period of 200 days. Does will have one or two fawns each year and will keep them hidden by themselves for the first few weeks of life. Fawns will lie quietly for hours until the doe returns from her forays for food. Fawns are scent-free during their first few weeks which allows them to remain relatively safe from bobcats and other predators. If you encounter a fawn lying by itself during your walks on the island, do not approach or touch it. Any interaction with humans greatly increases the chances of the fawn being killed or injured. At about four weeks, the fawns will begin to follow the doe, eating whatever she selects. The white spots on their reddish-coats will begin to fade after three or four months. Female deer live together in groups, typically consisting of a matriarchal doe, this year’s fawns, and her female offspring from previous years. Female fawns will remain with their mother indefinitely, whereas buck fawns will be driven off after the first year to establish their own territory elsewhere on or off the island. Deer reproduce quickly and when their numbers are not controlled they can overpopulate an area, resulting in damage to themselves as well as the surrounding natural environment. The 30 to 35 bobcats that patrol the island are an important source of control for the deer herd. Bobcats typically take a large number of fawns during the summer months. Another significant source of mortality for deer is automobile collisions. Approximately 20 deer are hit each year by automobiles on Kiawah Island. In addition, alligators also occasionally eat fawns or adult deer. Since 1997, The Town of Kiawah Island has conducted spotlight surveys to determine the white-tailed deer density on Kiawah Island. These surveys are done several times per year and allow biologists to track population trends over time. The information gathered from these surveys is used to determine future management plans and to determine the effects of past management practices. Annual deer densities (deer per square mile) are shown in the figure below. The red line indicates the population trend. 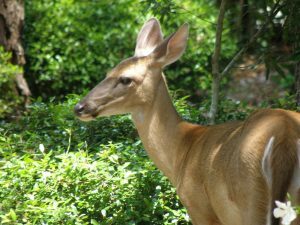 Because deer overabundance is a significant problem in many areas of the country, the Town of Kiawah Island, in conjunction with the University of Georgia School of Forest Resources, studied the size and health of the deer herd on the island between 1996-2005. Initial research showed that the deer herd was healthy and in excellent nutritional condition, but that deer-vehicle collisions were a significant problem. In order to better manage the island’s deer herd, an experimental fertility-control program was initiated in January 1999. This exciting research was conducted within the central third of the island from 1999-2002. Post-study analysis has shown 50% fewer fawns in this area as well as a reduction in deer-vehicle collisions of approximately 75%. These declines in population numbers and vehicle collision rates were caused by a combination of direct and indirect factors, including the fertility control program and an increase in the efficiency of bobcats as predators of deer fawns. Beginning in 2002, the Town of Kiawah, in partnership with the University of Georgia, conducted a Fawn Mortality Study. The goals of the fawn mortality study were to determine the recruitment ratio (the percentage of fawns which survive to adulthood) in the population, and to determine the primary factors of fawn mortality, specifically the role of bobcats. This 4-year study ended in 2005 and determined that bobcat predation is the major factor influencing fawn mortality (bobcats killed 55% of 129 deer fawns collared during the study), and that bobcats along with other mortality factors are able to maintain the deer population at current levels. The management of the deer herd on Kiawah Island is an ongoing process in which many management techniques are discussed and evaluated. A wealth of information has been gathered during the last twenty years which will allow wildlife biologists to determine the best deer management practices for the island. Currently, Kiawah’s deer population is controlled by natural predators, including bobcats and alligators. There is no hunting on Kiawah Island.